Mix the first 6 ingredients to form the sauce for the dish. Make a paste from the garlic, chile, and shallot. You can use a food processor, mortar and pestle, or just go at it with your knife for awhile. Remove the seeds from the chiles before adding to the paste, but if you are daring, leave the seeds from one or two. Rip the basil and cilantro leaves off the stalk and maybe rip the basil leaves a few times to make them smaller. Cut the green onion into rings. Cook your noodles according to package instructions and give them a quick rinse. Run a knife through the fresh peppercorns, just to break them up a bit. Thin slice the onion, tomato, chicken, and the baby corn. At this point, everything should be prepped and ready to cook! Get your pan super hot with a little veg oil. Start with the paste and peppercorns and cook for about 1 minute, stirring constantly. Add the chicken and keep stirring, about 2 minutes. Make a spot in the center of the pan and add the eggs. Keep stirring! Add the tomatoes and baby corn. Stir around and decide if it needs the rest of the sauce or not. Add the basil and remove from heat. Serve and garnish with green onion and cilantro. Thinking about this recipe last week, I was excited to give Tablespoon readers a nice beginner Thai dish to try out, as an intro to Thai cooking. My recipes on this blog so far have been pretty involved, so I was happy to bring something easier to the table(spoon). I sat down tonight to write out the ingredients and steps, and I was pretty surprised that there were so many! What happened to my Thai 101 recipe? 20 ingredients and 16 steps is NOT it. But then I started to think about it, and realized that yes, this simple Thai stir fry recipe is disguised as something complex and confusing! Let me break it down for you. The next 4 ingredients make up the aromatic portion of the stir-fry. They go in first, and set the tone for the rest of the ingredients. Fresh Peppercorns - This is the most "exotic" Ingredient in this dish. Black pepper is dried peppercorns, but fresh green peppercorns are essential to drunken noodles. You probably wont be able to get fresh-fresh, but you can find fresh-preserved ones in a jar in most Asian food sections of the grocery store. They will be in a brine or salt, and look like capers! The next 7 ingredients should look familiar if you have ever made stir fry before. Honestly, you could switch these up any way you choose, just use your favorite stir-fry stuff! Lastly, some basil, cilantro, and green onion for garnish. 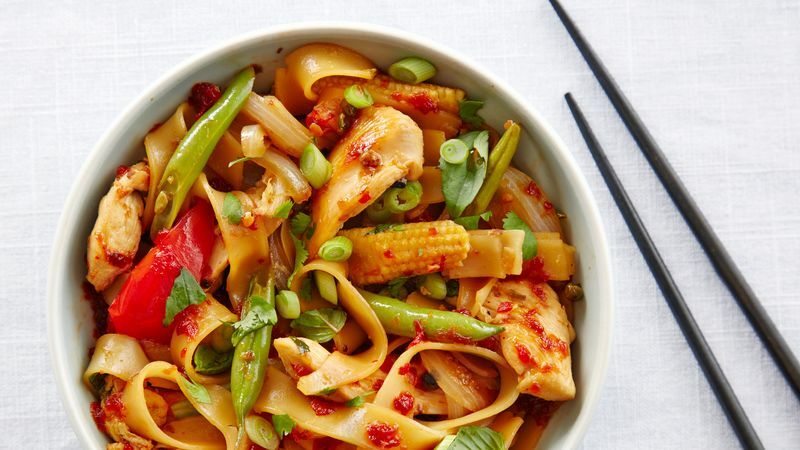 The detailed Drunken Noodles recipe can be seen here, but there are some photos of the process below. The beginning of most Thai and Indian recipes look just like this. The most important thing when cooking a stir fry is to have everything ready and at your fingertips before you start! The garlic chile shallot paste frying with some fresh peppercorns. Onions and green beans go in after the chicken. These ingredients are really up to you! Everything in the pot for the final mix. Basil goes in last just as the heat is shut off. This recipe is very tasty! I need to make it again soon. Spicy, tangy, fresh, and a unique kick from the peppercorns.